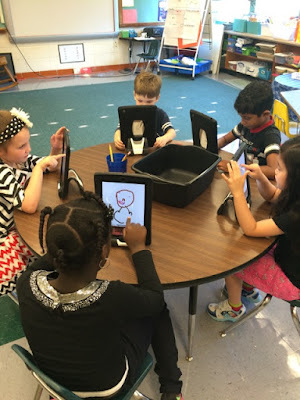 This week, our kindergarten students in Mrs. Potts' and Mrs. Kearney's classroom put their talents to work as they drew their self portraits, using the iPad app Drawing Pad. Students were mindful of their color choices, body parts, hair, and clothing. Then students "autographed" their work by placing their first name on their drawing. Their completed work then became pages in a classroom book using Book Creator, and finally the finished product emerged via iMovie to add a little music and movement to the book. Enjoy our artists' illustrations! We're back on Twitter! Follow us @pineglenltc1! It was bookmark week last week in the Pine Glen Library! Miss Carney explained to our students why bookmarks are an important part of helping us take care of our library books, and students then had the chance to decorate their own bookmarks. Once the bookmarks were decorated, Miss Carney laminated them so they will stay nice and strong for this school year and hopefully beyond! We had a great time creating these bookmarks, and the students did an excellent job and were so creative. This week, students in Mrs. Hoyt's and Ms. Bennet's kindergarten class, room 103, we excited to learn about ipads and how they could use the Drawing Pad app to draw their self portraits using only one finger! All students were eager to try! Take a look at our works of art! Pine Glen's Open House Night will be this Wednesday, September 16th from 6:00pm to 7:30pm. Our night will begin with opening remarks from Principal John Lyons at 6pm in the school's cafeteria. The back doors of the cafeteria will be open to allow parents to enter and exit the building. Beginning at 6:15pm parents are invited to visit classrooms to attend informational sessions. The first session will run from 6:15pm - 6:45pm. The second session will run from 6:55pm - 7:25pm. Parents and invited to attend either session. Miss Megan Carney, librarian and Mrs. Michelle Ardizzoni, instructional technology specialist, will both be available during these sessions to meet with parents to discuss curriculum, expectations, projects, and to establish relationships with parents. We are looking forward to meeting you. 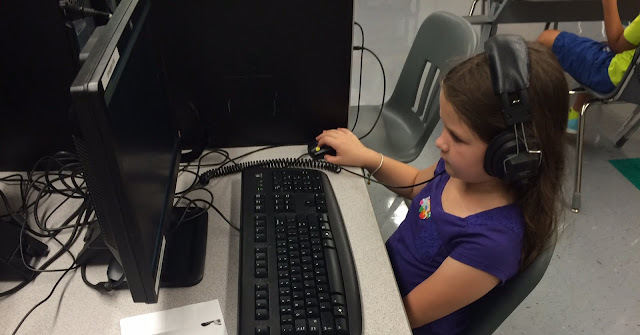 First grade students in Mrs. Hayes' classroom took the i-Ready screener today. 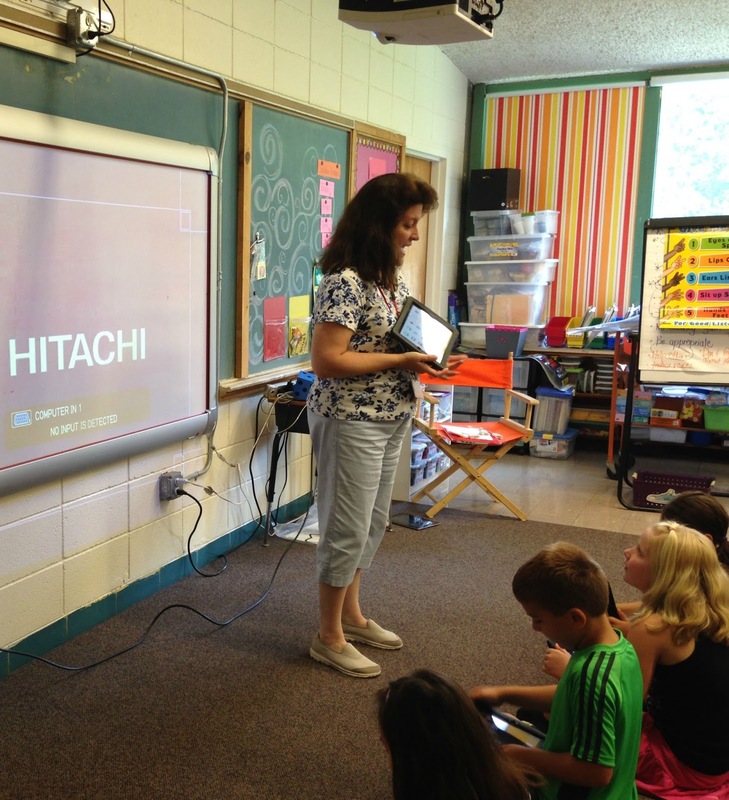 All students at Pine Glen receive universal screening for math and literacy. This allows us to asses student's skills and focus our instruction. We also learn which students will benefit from interventions to improve skills. I often think of it like a pediatrician taking the temperature of 289 children at the same time. * Note this post originally appeared on Principal John Lyons' blog. As the 2015-2016 school year begins here in Burlington, we wish all of our students, parents, and volunteers a warm welcome. Miss Carney, librarian and Mrs. Ardizzoni, instructional technology specialist, are excited to be teaching at Pine Glen and are looking forward to supporting many classroom projects! Let's have a great year of learning. During the first week of school, our third graders were learning about using their Google Drive and Google Docs apps on their iPads. Using the Google Docs app, students typed their response to the leading question of "What are you looking forward to in third grade?". Using the strategy of "TTQA", meaning "turn the question around", we discovered our students are looking forward to third grade field trips, math, running the mile in physical education, science experiments, violin lessons, playing the recorder in music class, and walking in the "Turkey Trot", a Pine Glen School tradition. This is sure to be a memorable year for our students.